Bahrain’s Prime Minister Prince Khalifa bin Salman Al Khalifa met In Manama on Sunday with Pakistani Chairman of the Joint Chiefs-of-Staff Committee General Zubair Mahmood. Talks during the meeting dealt with bilateral relations, particularly in the military field, Bahrain News Agency (FNA) reported. 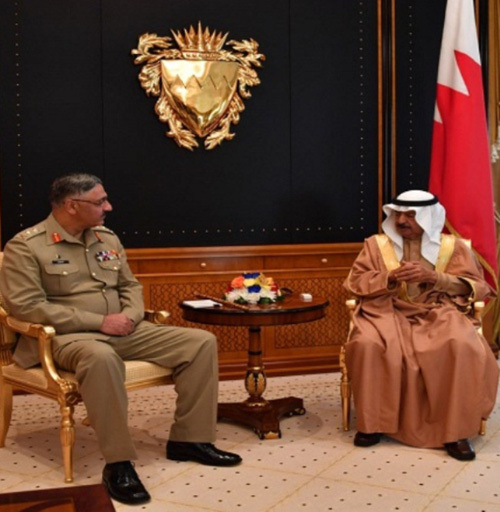 Commander-in-Chief of Bahrain Defence Force (BDF) Field Marshal Sheikh Khalifa bin Ahmed Al Khalifa also received at the General Command headquarters Pakistani Chairman of the Joint Chiefs-of-Staff Committee General Zubair Mahmood and his accompanying delegation. After an official welcome of General Zubair Mahmood, a discussion session was held between the Bahraini and Pakistani sides under the chairmanship of the BDF Commander-in-Chief and the Pakistani Chairman of the Joint Chiefs-of-Staff Committee. The meeting was also attended by Defence Minister Lieutenant General Yusef bin Ahmed Al Jalahma, BDF Chief of Staff Lt. General Dhiab bin Saqr Al Nuaimi, Defence Ministry Undersecretary Major General Sheikh Ahmed bin Mohammed Al Khalifa, senior BDF officers and Pakistani Ambassador to Bahrain Javed Malik. General Zubair Mahmood listened to a briefing on the history of Bahrain Defence Force and its development in the prosperous era of His Majesty King Hamad bin Isa Al Khalifa. The BDF Commander-in-Chief welcomed General Zubair Mahmood, stressing the importance of the visit in further strengthening bilateral military cooperation. He also lauded solid relations between both countries and their progress at all levels. He also pointed out the leadership's keenness on further promoting bilateral relations for the best interest of both countries and peoples. Both sides exchanged commemorative gifts. Then, General Zubair Mahmood and Field Marshal Sheikh Khalifa bin Ahmed Al Khalifa paid a visit to the Royal Command and Staff College (RCSC) where they were welcomed by the College Commander Rear Admiral Abdullah Said Al Mansouri and senior officers. The BDF Commander-in-Chief held a lunch banquet at the BDF Officer Club in honour of General Zubair Mahmood and his accompanying delegation. The lunch banquet was attended by senior BDF officers.